First of all, on behalf of all of the dedicated employees here at ACE Data Recovery we would like to thank our Partners for the business you have sent us over the years. Our success is due in large part to your continued dedication to, and confidence in, ACE Data Recovery as a top service provider. Secondly, I want to introduce myself. My name is Steve Aldridge, and I am the Senior Director of Global Sales & Service. I came onboard in August and have been working non-stop in developing new ways to work with our partners to increase your revenues. It's great to be here at ACE Data Recovery and I look forward to a building a long and prosperous relationship with each of you. To that end we will be announcing a new Premier Partners program very soon. The intent of this new program is to help you better sell recovery services, increase profits, and expand your customer base. Should you have any questions or issues, please don't hesitate to call me in my Dallas HQ office. "I have used Data Recovery Services twice in the past two years to recover data from crashed hard drives - once for a laptop that was dropped and once for an external drive that was the backup of that laptop that was dropped and damaged. In both cases, Data Recovery Services representatives were quick to respond to my inquiries, provided timely analysis of the problems with detailed explanations I could understand, and were able to recover all of the lost data and return this to me in a very expedient manner. I have since moved to a back-up of my back-up system which will hopefully keep me from having to do this again. However, should I ever be asked for recommendations for a data recovery service I will be very happy to recommend Data Recovery Services as a quality service provider that is dependable and fast." Quint Newcomer, Director, University of Georgia. 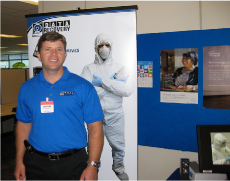 In September, Dell graciously hosted Data Recovery Services at their Global Command Center in Round Rock, TX. ACE Data Recovery are one of only 3 vendors in the United States that Dell recommends for their customers' data recovery issues. Many of the several hundred agents in the Command Center came by the ACE Data Recovery table to talk about how they can best help Dell customers with their recovery challenges. ACE Data Recovery CTO, Eugeny Tolkunov, provided the Dell agents a unique opportunity to see some of the custom designed and built hardware and software used to solve customers' problems. One lucky Dell employee went home with a brand new Nook Tablet he won from the drawing held at the end of the day. Other prizes such as Visa Gift Cards and portable Monster speakers were also given away as a small token of appreciation to Dell for hosting the event. Charles Walker, CEO of ACE Data Recovery, called the event "A tremendous success." He went on to say that "We have an excellent partnership with Dell and we truly appreciate their confidence in our ability to not only solve complex recovery issues, but also to increase customer satisfaction and loyalty." 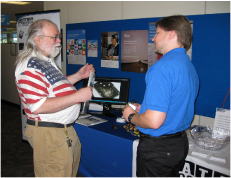 ACE Data Recovery plans to hold similar events this year at Dell support centers in Oklahoma City and Nashville. "On the advice of Dell, we originally sent drives to DriveSavers for recovery. After 4 weeks and three different attempts, DriveSavers was 100% unsuccessful in recovering any data. They returned our original drives and provided us with a full refund. Unsure and not hopeful that data recovery was possible, I asked our team to send the drives to Data Recovery Services. Unknown to me, our staff shipped the drives to you in the same box we received from DriveSavers. ACE Data Recovery was able to recover all but two of the Hyper-V machines from your data recovery effort. We consider this to be an excellent result given the circumstances. 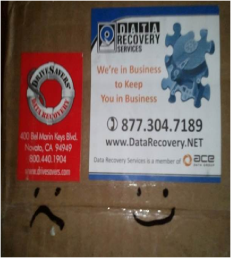 Interestingly enough, your team returned our recovered data and original drives in the same shipping box with a very accurate visual portrayal of the recovery status. Someone has a sense of humor and we laughed when opening the box. We all hoped the visual portrayal would be true. I want to thank you and your team for their knowledge, expertise and quality of work. While I hope we will not need your services again, Data Recovery Services will be our first line of defense." Kristi L. LeaMaster, the President of KI Systems, Inc.
Self Encrypting Drives: Better Security or Recovery Nightmare? In January 2009, the Trusted Computing Group (TCG) published final specifications for Self Encrypting Drives (SEDs). In March 2009, hard drive suppliers started shipping SEDs. Since then It seems they have all embraced self-encryption as the standard going forward. However, a deeper scrutiny of the technology reveals questionable security implications and a disastrous potential for permanent data loss. With SED, It's not outside the realm of possibility that the only guaranteed case where your confidential data is "secure" is when your drive fails and your data becomes unrecoverable. Taking into account the dozens of high profile breaches that have occurred over the past few years, the potential for critical encryption algorithms or databases reaching the wrong hands is not insignificant. The more governments and enterprises become reliant on hardware disk encryption the higher the risk of a future breach of classified or proprietary data by the parties with the greatest potential to do harm. When considering that almost all classes of enterprise and laptop drives currently include SED variations, the risk for both corporations and individuals is very real. Security best practices are likely to be loosened by corporations believing they are secure with SED's and the relatively poor security habits of individuals will deteriorate further with the expectation of an easy security solution. Most will be left exposed to future hacks and exploits of self-encrypting drives. Just as dangerous is the inexplicable omission of hardware encryption in the listed features of new drives, especially SSD's. For many, the invisible encryption process will mean losing their data because of a feature they didn't need and didn't even know they were purchasing. So what alternatives to dealing with SED's are enterprises and governments left with? Unfortunately without a proactive push to enforce a clear choice between encrypted/non-encrypted drives, there may not be a good alternative for much longer. However, forward thinking enterprises may still have a viable fall-back within the shrinking field of non-SED drives available with the implementation of quality software encryption and carefully managed security practices. Having a strong and informed position on the industry-wide propagation of SED technology can make all the difference in avoiding unrecoverable data loss.